Top artists from Canada and Republic of Moldova will perform on stage for a total of 10 hours of Live Entertainment… Please visit the Performers page too see them. We are proud to have Rucsandra Maria Saulean and Costa Tovarnisky to be the 2th Romanian Summer Festival MC! Rucsandra Maria Saulean’s music is too complex to define in a single word, as her songwriting and interpretive style is eclectic, inspired by the Celtic and Transylvanian folklores, polished with strong soul, blues, gospel and jazz hues. Endowed with a stunning vocal and acting talent, she started singing on stage in front of large audiences at the age of six. By the time she turned eight, she was playing leading roles for and touring with the award winning children’s musical theatre group of the School of Arts in her hometown, Miercurea-Ciuc. The secondary school years marked Rucsandra’s recognition as an exceptional singer and actor thanks to her astounding performances in top shows, festivals and celebration events. At the age of 12, she started her decade-long singing experience as a mezzo-soprano in highly trained church choirs, one of them being the National Award winning Christian Orthodox Faculty Student Choir of the Babes-Bolyai University in Cluj-Napoca. She later refined her classic opera voice at the School of Arts in Cluj-Napoca. At only 17, Rucsandra was already featured on the radio as a folk and blues singer and songwriter inspired by the old ‘doine’ and by the unequalled work of the nation’s giant culture figure Adrian Paunescu. In May 1998, during her university years, Saulean became the co-founder of the student folk group Altfel, and was featured on Antena 1 national TV channel as special guest in Paunescu’s live-to-air show, Nightshift. This meant the beginning of her innumerable TV and radio appearances, musical performances at national and international festivals, shows, studio recordings, music awards. Established in Canada since 2006, she has taken part in three editions of The Toronto Romanian Festival, sang for various corporate and charitable events and was also invited to do the backing vocals for singer Gilmaro’s Christmas Songs CD launched in December 2008. In May 2009, Saulean launched Soul Inn, her first jazz CD consisting of a fine collection of ballads, swing, bossa and blues standards. Soon after that, she graduated the Vocal ScienceTM Program trained by Diana Yampolsky, B.M. Ed., and is currently studying piano with international jazz sensation Gia Ionesco. 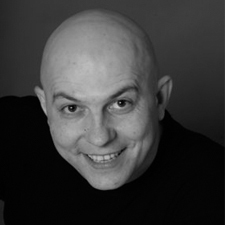 Costa (Constantin Tovarnitchi) performed and taught at the State Circus of Chisinau in Republic of Moldova, the National Theatre of Timisoara in Romania and Pygmalion Theatre of Vienna, Austria. He has had the opportunity to perform in many different languages (Romanian, Russian, German, and Hungarian) in several European countries. After his European journey Costa decided to start off his career in North America, so he settled in Montreal where his passion for Commedia dell’Arte got him closer to Le Théâtre de l’Utopie where he continued his Francophone career in ”Parlerie des mercenaries”, ”Molière en hiver” and ”Mr. Leonida faces the Reaction” adapted and directed by Cristina Iovita. In the Luso drama’s production ”Ma couleur est verte and mon coeur est jaune” directed by Marilda Carvalho, he had the chance to work with a multicultural team of actors which gave him a new perspective on other cultures active on the Canadian stage. At the same time Costa continued his Anglophone career with One Night in Berlin directed by Liesl Barell at Montreal Fringe Festival. He also taught mime at Montreal School of Performing Arts. In film Costa had lead role in Noon directed by Dan Popa, which was selected and presented at Toronto International Film Festival 08. After much consideration, he has decided to make his home in Toronto and was excited to take a step forward in his professional career in a new city. Shortly after that, he has appeared in the CBC action series The Border and in the Comedy Network series Jon Dore Show. On stage he had his first contact with Modern Times Stage Company last summer with workshop Only sounds remains directed by award winning director Soheil Parsa. He introduced Costa to Vahid at Goossun Art-illery and after his participation in the Toronto workshop, Costa was invited to participate in Denmark at first residency at Odin Teatret for the project HamletZar. Costa continues his collaboration with Modern Times Stage Company in their new production Hallaj, this representing his debut in theatre in Toronto.